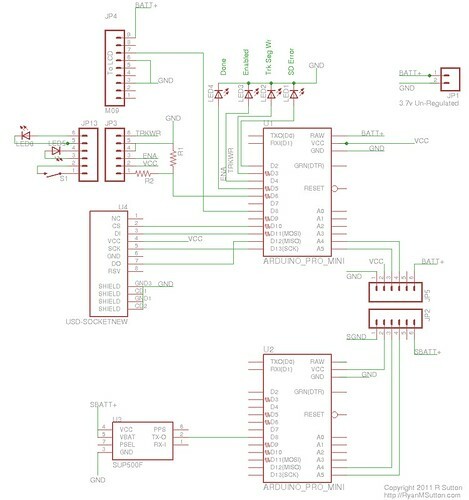 Published on November 26, 2011,	by RyanMSutton in Arduino, Software. In order to get some of the features like serial ports and I2C working on my atmega1284p chips, I needed to update the Sanguino core I have been using. The latest one published is based off arduino 0018 which works ok, but 0018 is before they had added strings and other useful features built into the core. I initially started updating the Sanguino core to 0021 which is what I was using as my dev environment but was having some issues with some conflicts in stdio and stdlib. From looking at the release notes the arduino team moved to register based pre-compiler directives rather then the CPU based ones used before. This method seems to be much better suited to alternative processors and is illustrated well here. So I moved forward updating the Sanguino core files to 0023 which is the current version on arduino.cc. The modifications are pretty simple, update the pin outs in pins_arduino.c and everything else just falls into place. I am currently working through testing functions on the atmega1284p I have gotten both UARTs working with out issue. I did need to make some modifications to the Wire library to get I2C working. Just needed to have it add pullups to the correct pins, this could have been done in hardware but I like using the software pullups. I believe SPI will work, but am still testing that. 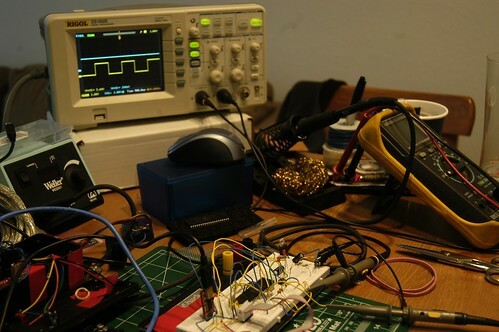 Published on November 25, 2011,	by RyanMSutton in Arduino, Hardware, Hardware. After having the boards for at least a month I finally built one up. This board dosn’t really do much new it is basically my GPS logging hardware v3.1 built onto one board. Since I was building my own boards I opted to use a atmega1284p since I was having issues running out of sram before (though I did clear that up in software). So there are two atmega1284p processors one to deal with the GPS and sensors, and another to talk to remote sensors as well as build and write the GPX file to the SD card. I also added an accelerometer and gyroscope to add to the data the sensor uC is collecting, I will probaly replace the atmega1284p on the sensor side with a atmega88 if the memory utilization is low enough, the 1284 seems a bit overkill for what it is doing. Published on September 29, 2011,	by RyanMSutton in Uncategorized. So 38 days after I ordered it and 31 days after the original ship date I finally have a new Thinkpad Tablet. 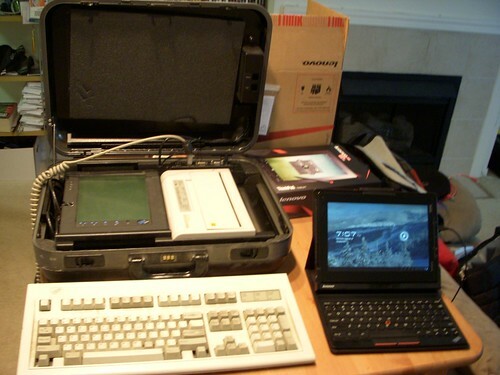 Shortly after ordered it I remembered that I have a old Thinkpad Tablet from 1993. When you look at some of the key features of both of them they are quite similar. First off the size, they are both roughly the same size length and width, thickness is a different story. Though screen size is nearly identical. Unfortunately the 1993 version dosn’t power up any more as I do not have the OS cards for it, at some point in the past I had gotten linux running on it but have no idea where those flash cards went. Also the batteries are completely shot. Both tablets also have available docking stations with keyboards. The 1993 version would be a bit tougher to carry around every day. But even the 2011 version is enormous by today’s standards when but into the dock. 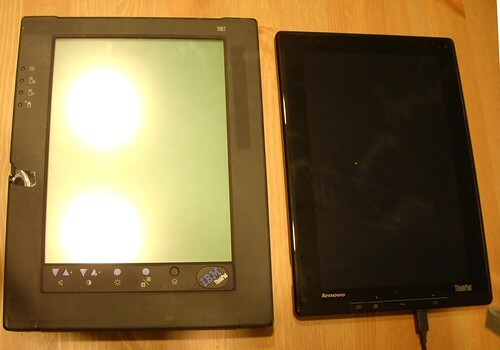 Just for comparison the new Thinkpad Tablet in it’s keyboard ‘Folio’ as Lenovo calls it is bigger then my Lenovo s205 netbook which is pretty insane. My biggest complaint about the new keyboard folio is that it connects to the only full sized USB port and does not have another on the folio. I was intending to use the tablet to write this post, but realised to upload the photos I would have to remove it from the folio, then put it back in to finish typing. 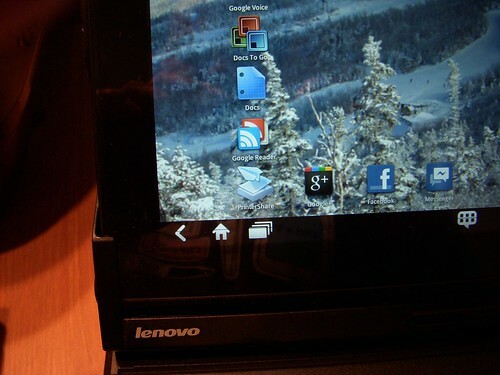 The next thing that IBM/Lenovo thought was important in both tablets was printing. 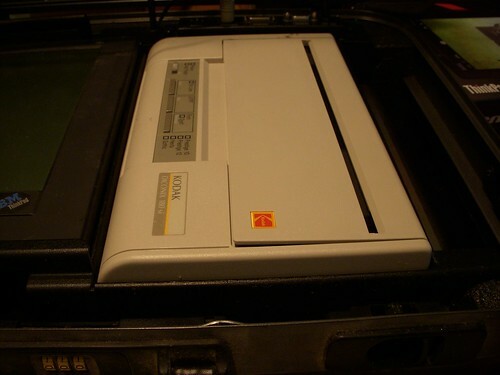 The 1993 version comes with a thermal printer in the dock, in 2011 Lenovo opted for a program called ‘PrinterShare’ being loaded. I don’t own a printer, and even at work I pretty much only use them for printing boarding passes so I really don’t have a use for either of these. The the new tablet already feels more useful then the Blackberry Playbook which I’m currently using. I will still continue to use the Playbook, mainly for the Blackberry Bridge feature which is great, but the Thinkpad may become my tablet for ‘everything else’ already got some critical applications working that do not on the playbook such as the admin interface to Cisco Communications Manager which is a big one. I’m hoping to get a physical ethernet connection working via the USB host interface but that will be tougher. Published on September 4, 2011,	by RyanMSutton in Hardware. So, I got my PCBs in yesterday, imediatly grabbed the solder paste put a bunch of components down, reflowed them and everything looked good. The power supply was actully very stable, even the components that didn’t have leads looked to be good. I did know of some errors on the board such as not running VCC, GND, and RST to the ISP header. Tying AREF to VCC rather then decoupling it. Fixed thoes issues, in the case of AREF I just cut the trace and moved on, no decoupling added. Oh an the biggest oversight on the board design was I left off the power connector. Many attempts at fixing a non-existent hardware problem. Imediatly after getting everything fixed, and hooking it up to my ISP programmer I started getting the message that was going to haunt me for the next 24hrs or so. I tried everything, followed every trace, added decoupling caps everywhere! Finally I decided I must have fried the chip when reflowing it and built up another board. Same results (this one the power supply wasn’t nearly as clean though, need to fix that). MOSI - Blue, MISO - Yellow , The slave would answer but would fail to read the signature correctly. What was really bugging me is that I was seeing traffic on both MOSI and MISO which ment both devices were talking to eachother at some point. I decided it must be something with the board design, went back to the computer and checked everything. Ran across a couple of posts that mentioned SPI clock speed being an issue, as these are new devices they are set to run off the internal oscillator which is 8mhz, with the divide by 8 fuse set resulting in a 1mhz clock. 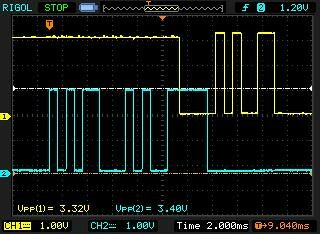 Come to find out the default SPI rate in avrdude is roughly 1mhz which will work for devices running at 4mhz or higher. Setting the SPI clock down caused avrdude to imediatly recognize the chip as valid on both boards I built. Tomorrow will be filled with trying to get a bootloader on them, and seeing what if any data I can get in and out of the sensors on the chip. Published on July 24, 2011,	by RyanMSutton in Hardware. A while ago I came up with an idea for a project that seemed to require a flexible LED matrix. I could not find any comerically available, and even flexible LCDs aren’t nearly as common as I would expect. 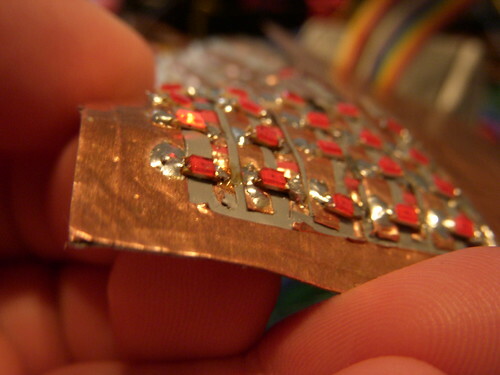 Getting a custom flexiable PCB created is possible, but pretty expensive and not exactly easy. Seeing as a LED matrix is a pretty simple circuit I started looking around for a way to make something at home. 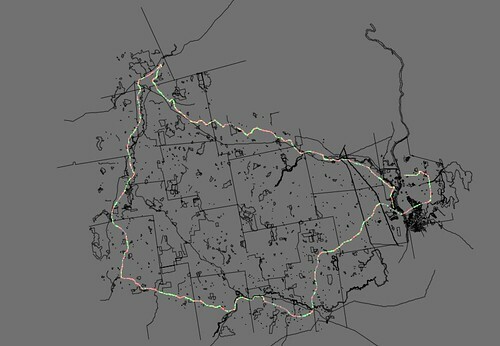 Published on June 26, 2011,	by RyanMSutton in Arduino, Software. When I was running into some issues of running out of sram on the atmega 328 I started to look at alternative chips, unfortunally the next chip up in the standard line is the atmega 2560 that is used in the Arduino Mega. Since I was focusing on sram i was mainly concentrating on that aspect for my next chip. The 2560 has 8k sram, which is nice ( compared to the 2k in the 328 ) but I saw the 1284P which has 16k. Before ordering some i looked around to see if anyone had put a arduino bootloader on it, and there were a number of people tinkering with them on the arduino.cc forms so I went for it. The main issue I was running into was that everyone on the forms wanted to run their chips at 16mhz or 20mhz, way faster then the 8mhz I use. So, this ment no using or even trying the .hex files posted by others. It was pretty clear from this thread, that the direction to go would be a modified Sanguino bootloader. The Sanguino project is a modified arduino stack ( bootloader and wireing library ) for the atmega644 which is the same class of processors and is pin compatible with the 1284. I had the timing issues with the clock change sorted out pretty early, but was still having issues getting the bootloader to write code into the flash. I could see code going from serial, to buffer, to page buffer, but the page just wasn’t being written by SPM into flash. I believe my main issue was the calculation of where the boot section actually started. When you look at the fuse descriptions they tell you where the boot section should start. For example I am using a 2048 word boot section. What they don’t make clear is that the address they give you ( 0xF800 ) is in words as well, then when you specify the load point to avrdude it is in bytes. This is probably something I should have found sooner, epically since this is the main problem referenced on the forms. So, when you load your application into the wrong section say 0x7C00 it will still run ( assuming your chip is otherwise blank ) since it is the first instruction in memory, but when it hit the SPM call, it will fail since SPM is only allowed in the bootloader section. 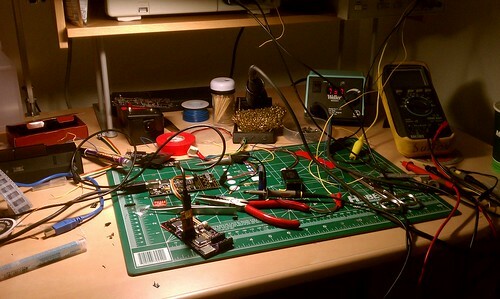 Published on March 12, 2011,	by RyanMSutton in Arduino, Gear. 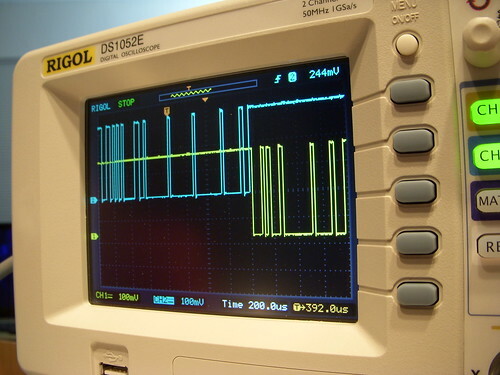 I got my first digital oscilloscope today, Ended up going with a Rigol DS1052E which seems to get great reviews around the net for a cheap scope. At about $400 it’s not the cheapest one around, but also far from the most expensive. I would say my tipping point was David’s teardown over on eevblog.com where he found exceptional build quality. I’m not going to do a full review, there are plenty of people who have done that, there is probaly more infomation on this scope on the internet then any other. 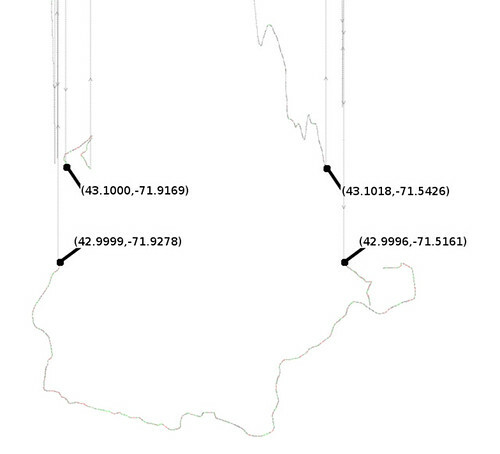 Published on February 28, 2011,	by RyanMSutton in Arduino, Software. I went back to the source file and quickly fixed them with ‘sed’ and the result is a much cleaner track. 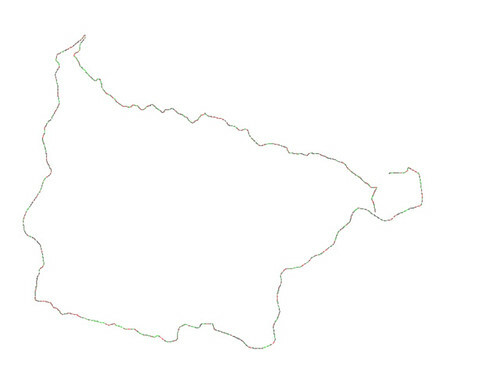 And when over layered with OSM (http://www.openstreetmap.org/) data the track appears to be very accurate! 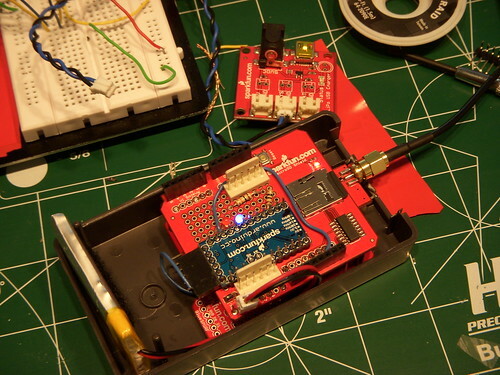 Published on February 22, 2011,	by RyanMSutton in Arduino, Hardware. 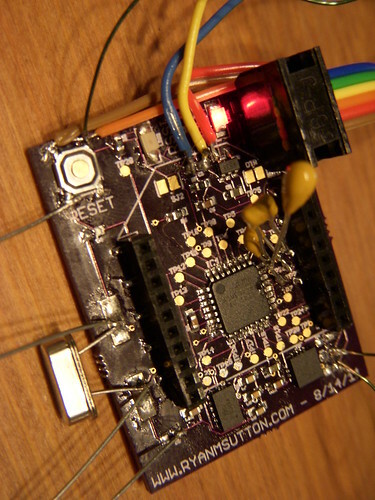 Published on January 18, 2011,	by RyanMSutton in Arduino, Hardware. Well this is not as much a new version but moving the components off the breadboard. It has always been my intension to use the small prototyping area on the microSD shield for my first revision of the hardware. All in all it has worked out well, the shield is for the most part the exact right size, nothing is too tight, but yet it is still small enough to fit in a small box along with the LiPo battery.